High Quality Content by WIKIPEDIA articles! 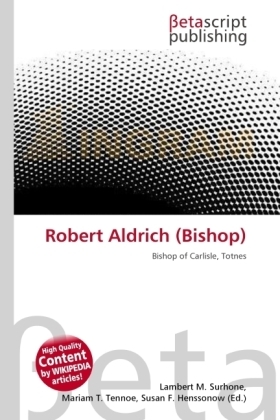 Robert Aldrich (died March 1555), or Aldridge, Bishop of Carlisle in the reigns of Henry VIII, Edward VI and Mary, was born at Burnham, Buckinghamshire, educated at Eton and Cambridge; after receiving various preferments was consecrated bishop of Carlisle, 18 July 1537. He became in 1534 register of the order of the Garter, in the room of Dr. Richard Sydnor, archdeacon of Totnes. He was praised by Erasmus, while he was a fellow of King's College, as a young man of eloquence; and Leland, the antiquary, who was his friend, has celebrated him in a copy of Latin verses. He was both master and provost of Eton; but in 1529 he retired to Oxford and was incorporated B.D. and afterwards proceeded D.D. in that university. He died in 1555 at Horncastle in Lincolnshire. The Bishop of Carlisle is the Ordinary of the Church of England Diocese of Carlisle in the Province of York.